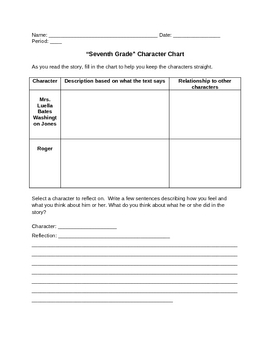 Use this character chart to help students keep the characters straight in Thank You, Mam, a short story by Langston Hughes. Intended to be used during reading as an active reading strategy, it helps students to think about what they are reading so that they comprehend the story better. For each character, students record a description and his or her relationship to other characters. After reading, students select a character to reflect on. This document is also available in the Thank You Mam All-in-One DEAL.